I've been at my new job for a few weeks now, and I love it! 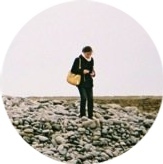 The work is interesting and intellectually challenging, and I couldn't be more pleased. I have a steadier workload than I used to (biglaw litigators generally have more consistent hours than our transactional colleagues, but workflow is still a bit feast or famine, with some slow weeks and some intense ones when multiple deadlines hit), which does leave less mental energy for blogging. Today's post discusses a few of the smaller things that have crossed my mind in recent weeks. Little Alley is a fairly new Shanghainese restaurant here. Shanghainese is not a Chinese cuisine I'm especially familiar with (their most famous dish is soup dumplings or xiao long bao), but I've enjoyed quite a few dishes there. Given recent developments at the restaurant I would otherwise have said makes the best soup dumplings in Manhattan, Little Alley now takes that title. There is, admittedly, not terribly much competition. Joe's Shanghai in Midtown isn't great, and I'm not willing to brave the line in Chinatown, leaving only Shanghai Cafe, which is solid but has a less interesting menu, in contention. Flushing has more choices for good soup dumplings. 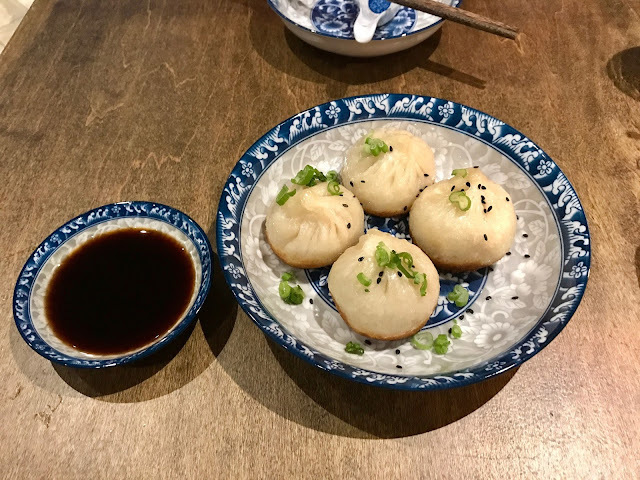 At Little Alley, my recommendations are soup dumplings, pan fried pork dumplings or sheng jian bao, pictured, the dong po pork, and the fish blossom, also pictured. 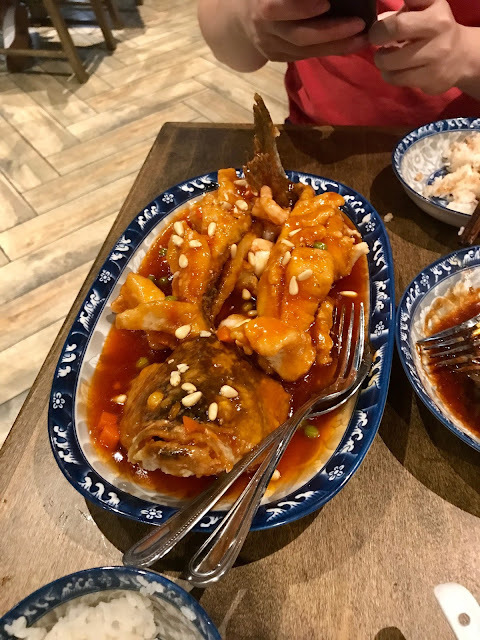 For the fish blossom, keep in mind that the sauce is sweeter and has different flavor notes from sweet and sour fish dishes that might be more familiar. I finally read Michael Cunningham's The Hours, which had been on my list for years. I have a somewhat strange attraction to the extremely somber Philip Glass soundtrack for the film, commonly using it as background noise at work. It's been a long time since I read a novel that I really enjoyed, and that I found emotionally affecting, but this one fit the bill. I suppose I really like books that are mostly about characters' complex inner lives. That's present in abundance here. With regards to my recent sudden desire for a camel coat, I've decided that a coat of that color with a waist tie likely wouldn't suit. Coats with belts are a difficult proposition for me, though I own two, the Everlane classic trench (current version) and that Ted Baker wrap coat. The style should be reasonably flattering on me, as a more or less hourglass figure (roughly 36''-27''-37''), I have a hard time getting the belts to stay in place and cinch close enough to the most narrow point of my waist. If the belt's not just right, I end up looking boxy, with my chest emphasized more than usual. So I'm in the market for more of a menswear-inspired chesterfield coat. I may have decided on the Polo Ralph Lauren cashemere blend coat that I previously linked. The shell is entirely wool and cashmere blend, no synthetic fiber, which I thought was rather unusual for coats at my general price range. (The fabric composition may cause me to worry slightly about durability and longevity.) I realized, however, that Uniqlo is also currently doing a chesterfield coat and stand collar coat with waist tie that also have all wool and cashmere shells, so it isn't that unusual. I ordered that Polo Ralph Lauren coat at a significant discount during a recent Macy's sale and, spoiler alert, with my family's rather eclectic gift giving practices (where the recipient orders their own gift, and the giver reimburses them), it may end up being heavily subsidized by birthday gift money from my mom, rather than something that comes out of my shopping budget. I'm still very sheepish about my mom's generous birthday presents, as I'm definitely a financially self-sufficient adult otherwise. Any novel or book recommendations? It's been difficult finding good books. I'm currently reading Thomas Stanley and William Danko's The Millionaire Next Door, which I would not recommend as much as other personal finance books I've reviewed, though it is a "foundational text" for financial independence, a philosophy that I think makes a lot of sense. I'm also reading Elizabeth Gilbert's Committed, which I find tiresome and self-aggrandizing, so I'll probably drop it without finishing.